Problem: Known Fact: your hospital will allocate at least 30% of its variable budget on labor resources. Where can you save money on labor costs without cutting services? Many times your labor to census ratios are not understood in time to make a difference on labor costs. You have OT being earned in one unit, then contract labor called in another, and meanwhile excess labor is available in a unit where the census is low. The variances to labor targets are understood long after the opportunity to re allocate staff to more productive areas has come and gone. 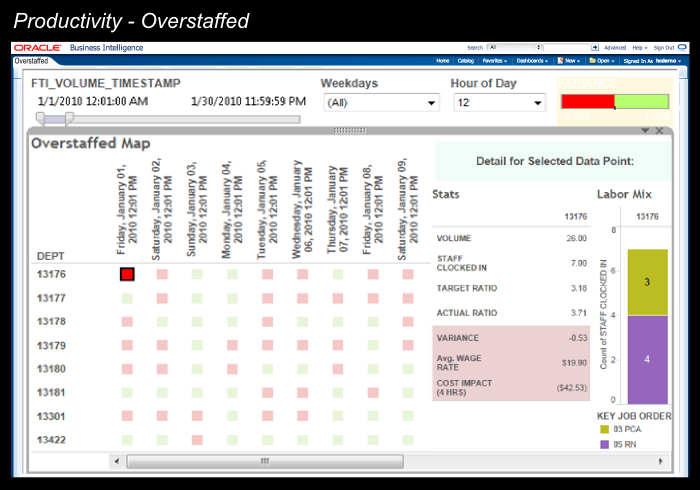 Solution: Aculyst offers the tools to see real-time labor activity assigned by unit, and displays nurse ratios in real time. Further, Aculyst allows you to see the entire spectrum of where labor resources are deployed and since we have interfaced with your ADT system, and payroll, we now can see the cost of those labor variances to targets. When users see a cost associated with not making a decision, the end user is compelled to solve the riddle and reset the variances and cost over-run to zero. How much capital do you think you can recover in labor costs that spiral due to over staffing? Result: When you see staffing trends for PTO, UPTO, OT and other workforce trends against volumes and cases, you begin to see patterns in the way labor is used based on seasons, patient volumes and DRGs, not to mention employee. Now that the labor ratios are pin pointed and reflected in real time every day, managers can dote on the enterprise and be sure that your staffing resources are deployed as the result of informed labor choices..